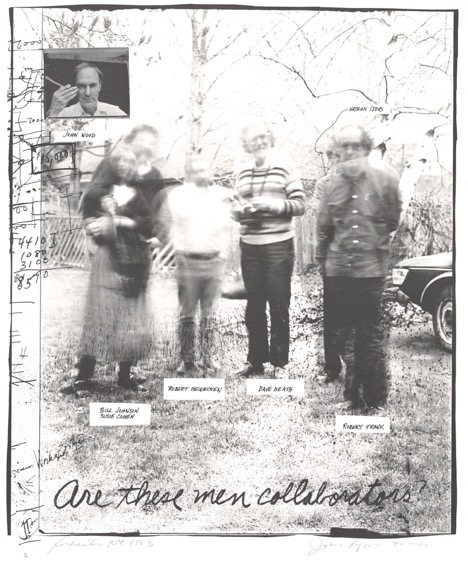 Joan Lyons, Are these men collaborators?, 1983. Photo: Susan E. Cohen and William S. Johnson Creativity Project Archive, Harry Ransom Center, The University of Texas at Austin. The Harry Ransom Center at the University of Texas at Austin has acquired the Susan E. Cohen and William S. Johnson Creativity Project archive, which comprises materials from a three-year initiative that aimed to create a comprehensive record of the creative process in photography. Called “Four Photographers: Robert Frank, David Heath, Robert Heinecken, John Wood,” the show was set to be staged at the Visual Studies Workshop in Rochester, New York. Cohen and Johnson’s catalogue essays for the exhibition were later published in the privately printed book Horses, Sea Lions, and Other Creatures: Robert Frank, Dave Heath, Robert Heinecken, and John Wood (Joshua Press, 1986). The archive includes more than fifty hours of audio and video interviews, research, essay drafts, letters, postcards, photographs, and rare monographs and artist’s books such as first editions of Frank’s Les Américains (Delpire, 1958) and Heath’s A Dialogue With Solitude (Community Press, 1965).